In the Northwest Territories (NWT), wildlife is sustainably harvested and nothing goes to waste. Traditionally-made arts and crafts are an important glimpse into our history and help preserve the rich Aboriginal cultures of the NWT. This heritage is evident in the artwork, shared by the artist for all to enjoy. 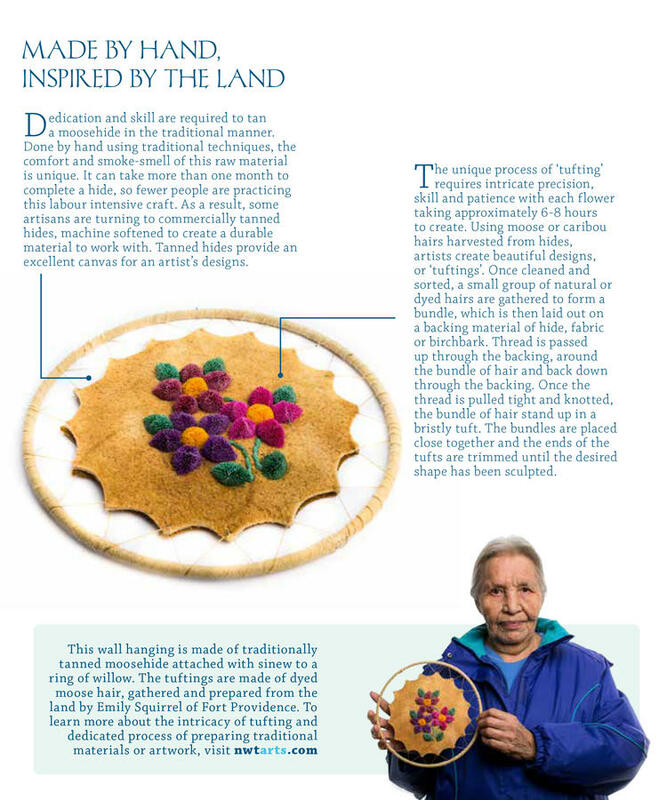 Tufting produces three-dimensional images by stitching and trimming bundles of selected moosehair onto tanned hide or birchbark. Tufting requires great patience and a sure, steady hand. Even though twisting moose and caribou hair is an old Athapaskan art predating European contact, the earliest documented examples of Dene tufting are from the 1920s and 1930s. Mrs. Boniface Lafferte (Lafferty), a Métis woman from the Fort Simpson area, was inspired by a resident nun who used wool in a type of work called “punch work”. Imitating this technique using moosehair, Mrs. Lafferty refined the art of tufting. Passed on through generations, this art form can now be seen in regions across the territory. Moosehair is the preferred material for tufting because of its stiff texture but hairs from the beard of caribou are also commonly seen. White hairs are handpicked from the shoulders and rump area of the moosehide, usually as it is being prepared for tanning. Many tufters find working with caribou hair more trying as the hair is much thinner, harder to dye and shorter in length. For these reasons, caribou hair tuftings are harder to find in today’s market. The hairs are sorted according to size, length and colour, then washed and soaked in preparation for dyeing. Hairs are tied into bunches and dipped into the dye or thrown loosely into the pot and dyed individually. Traditional dyes were made from roots, lichen, flowers, bark and various assorted berries gathered in the wild. Today, commercial powdered dyes and crepe paper are the most commonly used dyes. These produce vibrantly coloured hairs. Hairs can also be left natural to give a feel of the land. Tufting is usually done on tanned hide or velvet reinforced by canvas. The pattern is drawn with a pencil, piece of bone or a small stick dipped in a mixture of flour and water. The outlines are drawn freehand so no two designs are identical. Flower designs, leaves and birds are traditionally found patterns in the Fort Liard and Fort Simpson areas. To create the tufts, about 15 to 20 hairs are grouped into a small bundle, of uniform size and colour and laid on the backing material. A thread is passed up through the backing, around the bundle of hair about ¼ inch from the end and back through the backing. The thread is pulled tight, causing the bundle of hair to stand up in a bristly tuft, and then knotted. The hair is cut and the process repeated until the area to be covered is filled. The bundles are placed close together so no division between tufts is visible. The ends of the tufts are trimmed until the desired shape has been sculpted. While sewing, the sorted hairs must not dry out or they will break. Hairs are kept moist by putting them in the mouth or keeping them rolled in a damp cloth. Another technique called line work is often used in combination with tufting to create borders and stems. To create a line, approximately half a dozen hairs are held together and secured to the backing with evenly spaced diagonal stitches. Before each stitch is pulled tight, the hair is given a slight twist producing a bead-like effect.